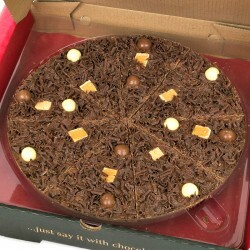 The Gourmet Chocolate Pizza Company was started in 2007 by a Nottinghamshire lady who one day decided to embark on an adventure of creativity with two of her favourite things - chocolate and pizza! The chocolate pizza’s she originally made as gifts for friends and family were a huge success. So much so, her head then became filled with lots of delicious flavour combinations to be tried and loved....and so began The Gourmet Chocolate Pizza Company. 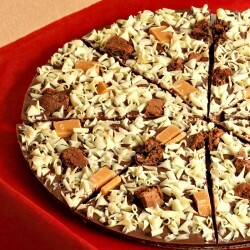 All Gourmet Chocolate Pizza's are hand made using the finest quality Belgian chocolate in Cotgrave , Nottingham and with a range of inspired sweet toppings including honeycomb balls, marshmallows and vanilla fudge there's a chocolate pizza for everyone. 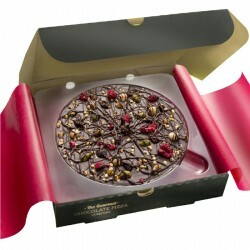 Send someone special a pizza delivery with a difference!